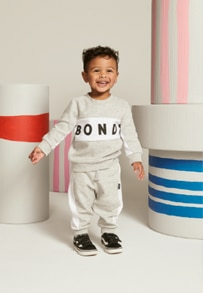 This year's Bonds Baby Search is unlike any other. Put simply, you asked and we listened. So, in the spirit of celebration there will be no more voting for your favourite bubs. Instead, a new winner will be drawn at random every day and two overall Wonderbub winners will be chosen by us. All up there is a whopping $40k worth of prizes to be won with the grand Wonderbub prizes including an unforgettable family holiday to Sea World, a professional photo shoot, plus the chance to star in a Bonds video campaign. Woohoo! And as if that wasn't exciting enough, this year we're also bringing you our first-ever Fur Baby Search! From 7th February until 28th February 2019 entries will be open to not just babies up to 4-years-old but also to pets so that all proud cat and dog owners can get in on the Baby Search fun and score some fur-friendly prizes. You're welcome! In the spirit of celebration, we teamed up with singer-songwriter Connie Mitchell of Sneaky Sound System to recreate Florence and the Machine's hit song You've Got the Love, which provides the soundtrack to our new video, above. Get ready to melt! There are so many new and exciting changes to this year's Baby Search, to find out what it's all about check out our What's New, Prizes and FAQs pages.